Amigapd would like to thank David for agreeing to answer some questions about his game Bull Run. David is currently working on a modern update of this game and more information about this project can be found by visiting this website. This interview was completed April 2013. For those who haven't played Bull Run before can you briefly explain the purpose of the game? 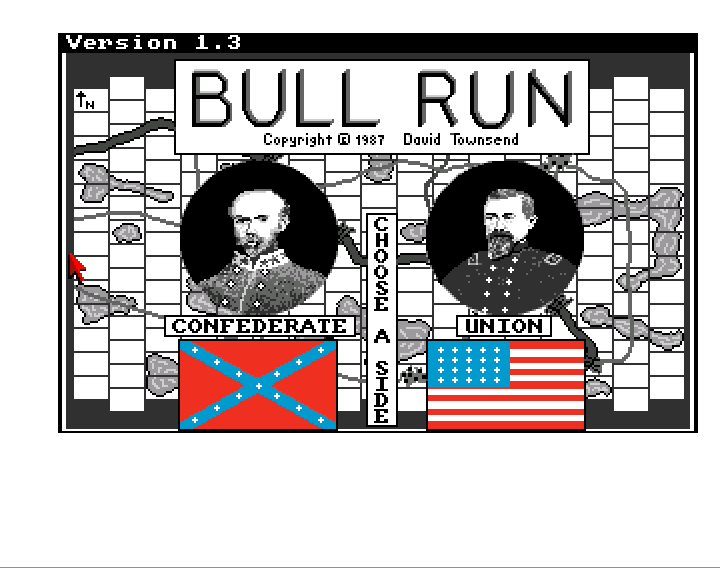 David Townsend (DT): Bull Run lets you step into the shoes of the Union or Confederate commanders at the Battle of Bull Run, the first major battle of the American Civil War. My focus was on ease of play and hidden information, which is much more manageable on the computer than in a board game. Want to know where the enemy is? You better send someone to find out! Was the game based on any traditional board game / wargame? DT: I used a variety of board wargames on the battle as source material for ideas and historical information, though there's no direct relation between my game and any board game. I also spent a lot of time reading books to make sure that I got the historical feel right. What attracted you to the American Civil war period? DT: I'm interested in a wide variety of historical periods, actually. At various times over the years I've focused on Greek, Roman, Medieval, Renaissance, Civil War, WW1, and WW2. Pretty much anything not too modern. I decided to do Bull Run for the practical reason that that battle, being one of the smaller engagements in the war, seemed a less daunting task than one of the bigger battles like Gettysburg. Plus the battle is fairly evenly matched, and the strategic situation is interesting, the two sides being separated by a river with limited crossing points and not enough people to defend everywhere. How did you create the sound effect for the movement of the troops? DT: The only sound effect that I can remember distinctly is the marching sound played when a unit moves. Remember, this was before the internet, and audio digitizers were brand spanking new. So there wasn't a lot of good source material that I knew of. Out of desperation, I took a pair of rubber flip-flops, clapped the soles together, and digitized that. I probably processed it a bit to try to make the sound a little less obvious. There seems to be different versions of Bull Run for the Amiga (we currently have version 1.3 on our website) how did the game evolve during the different updates? DT: I can't find all of my notes. My memory, which might well be pretty faulty at this time, says 1.0 was the version I handed out to my playtesters, and 1.1 incorporated their feedback. Version 1.2 updated the enemy unit graphics from blank rectangles to little flags, added double buffering for smoother animation, and added color cycling for the river. Version 1.3 let you turn the sound off (I guess I didn't have a volume control on my speakers) and adjusted the points values for having units near the enemy town to make the AI more competitive. There were a lot of bug fixes in each version, of course. Was Bull Run the only game you coded or did you make other games for the Amiga or alternative computer systems? DT: After Bull Run, I co-wrote a subway-building game called "Metro" for the Amiga. 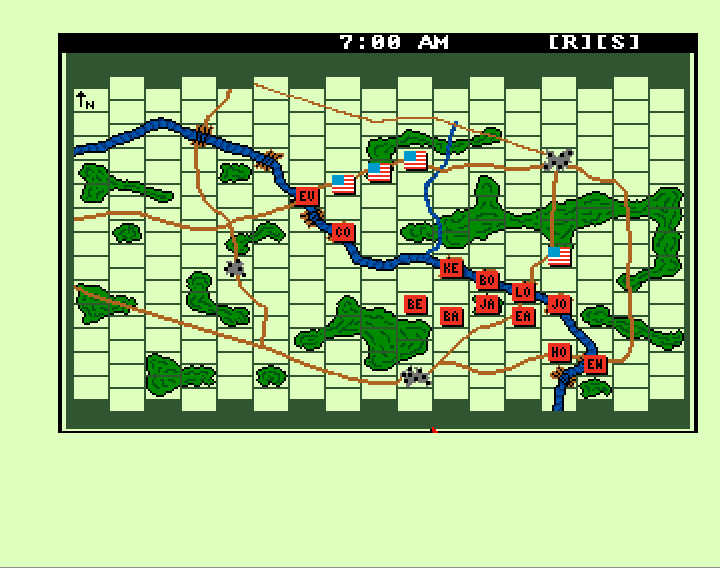 That game was inspired by the Washington DC Metro's schematic maps. It got mentioned in the release notes of one of the later AmigaOS versions, something to the effect of "Highlight menus now use same pens as normal menus. Fixes Metro." That was kind of neat ("Hey! Commodore knows our game!") and yet also humbling ("Bummer! We made more work for those guys!") at the same time. Other games on Roman history and the Hundred Years War died on the vine. Are there any specific tactics you would recommend when playing the game? Is there any advantage to selecting skirmish / charge or attack? DT: As the Union, the Confederates don't have enough strength to cover all the fords. So go where they aren't. As to modes, Charge gives you the best chance of forcing the defender to retreat, but at the cost of the greatest number of casualties. Skirmish is unlikely to force the defender away, but minimizes your casualties and, like all the attack modes, still cancels any pending action of the defender. Attack mode is the middle ground between Charge and Skirmish. Internally, the units are rated as to their historical effectiveness and that also plays a large part in how well they perform in combat. You will get better results attacking with Sherman, Longstreet, or Jackson regardless of mode than you will from Holmes or the Union Militia. Though you can't access those ratings from the UI, I did provide them with the manual that I sent out for players sending in money to support the game. You can get some sense of the relative ranks by watching the order of movement, as better units tend to move first. What programming language did you use to create the game and do you still have the original source code for the Amiga version? DT: The game is entirely written in C. I'm not sure if the source code disks still work, but fortunately for me I made printouts of all the code when I was done. How difficult was it to create the computer Articial Intelligence and did you ever consider adding a two player option? DT: I had run across a couple of articles on programming wargames AI in BYTE magazine and Computer Gaming World. Those were pretty helpful in getting me started. (Remember, no internet!) I quite enjoyed the AI work and still vividly remember the thrill I felt the first time I saw the units moving under the AI's control. Also the frustrations when the AI would do something really stupid. I never really considered a two-player option. Because of the sighting rules the interface would have been awkward for two players using the same computer. Network programming wasn't common back then so I didn't really see a market for two players connecting and playing. From your website it seems that work has started on a modern update of Bull Run for modern PCs - how is this progressing? DT: I've been working on an iPad version of the game. It's still in its initial stages. I had originally hoped to be done this year but we'll see how that goes. The code is converting over reasonably well though of course iOS is very different from Intuition. I'm trying to separate out the information specific to Bull Run from the core game engine, so once Bull Run is done then putting out other battles should be relatively easy. Updating the graphics to the incredible Retina display is hard for me, though. I'm a programmer, not an artist. If there are any enthusiasts out there with graphics talent, please contact me! Bull Run can be downloaded from the link below. 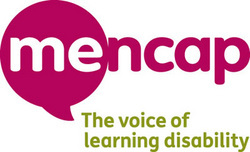 AmigaPd would like to thank David Townsend for taking the time to answer these questions and wish him all the best with his current project.